With the first stirrings of spring this week I got an urge to meet some of the new calves that have emerged blinking into the light on West Cork farms and are waiting to take to the fields. I paid a visit to Paul and Yvonne Johnson who farm 60 acres at Kinrath, north of Dunmanway, where they are raising a herd of one of Ireland’s genetic treasures – Dexter cattle. As it happened Paul’s cows calved in the autumn and the calves are quite sturdy now. So I missed the tender early days but the few months that have passed meant that the cows were not at all protective of their young and quite comfortable with a stranger in the pen. What struck me most was how much Paul and his cattle enjoy each others company, he knows each by name and seems profoundly relaxed among them. In spite of their long, sharp horns I eventually relaxed too as we drifted from one topic to the next. Dexters are one of the rare native breeds in Ireland that are now designated as endangered, the list also includes Kerry cattle, Irish Maol cattle, the Irish Draught horse, the Connemara pony and the Galway sheep. Some new life has been breathed into rare breed conservation with the introduction of a premium payment for these breeds under REPS (the Rural Environmental Protection Scheme) but as Paul pointed out to me the scheme needs a bit of tweeking to take account of the requirements of individual breeds. Dexters are a hardy breed of small mountain cattle, generally black like the Kerry’s with which they are often confued. They can also be red or dun. They originally derived from the Celtic cattle of ancient Ireland and the Dexter breed is particulary associated with Cork. Paul gets some satisfaction from knowing that he is continuing a tradition with this breed. Kinrath ringfort on their farm was once a stronghold of the McCarthy clan that dominated this part of Munster. When the McCarthys were at the peak of their power, cattle like these were the backbone of the social, political and economic structures. Dexters are among the smallest breeds of cattle in the world, and became popular in the 1800s as an ideal “cottager’s cow”, producing plenty of milk for the house and a calf to be reared for beef each year. The animals vary in size, but are about half the size of a Hereford and roughly one third the size of a Freisen milking cow. 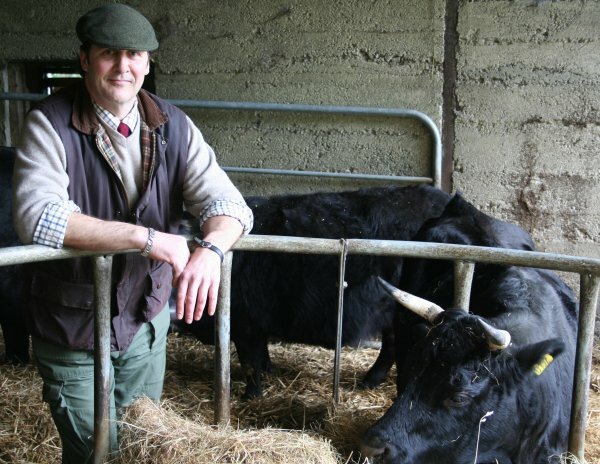 They are enjoying a resurgence in popularity in the UK and North America as an ideal smallholder breed, particularly because of the ease of calving In fact Hugh Fearnley-Whittingstall’s River Cottage project on Channel 4 feature’s Dexter cattle. to the Collins brothers in Dunmanway, where it is subsequently hung for 4 weeks before it is cut, packaged and frozen. Paul then brings the frozen meat back to his walk in freezer. He sells the meat at Bandon Farmers Market from a freezer in the back of his 1950s Land Rover. He finds slaughtering his animals hard and says he needs a couple of days solace after the event, during which time he can be quite irritable. Raised near Bristol by an Irish mother and an English father, Paul’s passion for the breed began at a rare breed show in the UK where a dream took hold – to raise Dexter cattle back where they originated in Cork. The couple bought the farm in 2000 but found their ambitions frustrated initially by the scarcity of Dexters in the country, none could be found to buy. So they started with Aberdeen Angus and continued looking. Their patience paid off and five years later they managed to buy 7 heifers from a farmer in Kerry. Now the Johnsons have 41 cattle and will continue expanding the herd through breeding and aquisition – most recently buying a bull, 2 cows and 2 calves from a farmer in Newcestown. Paul practices organic farming and is registered with IOFGA. He is very keen to promote and rejuvinate the rearing of Dexters in Ireland and sees their positve impact on the environment as a key advantage. They do not graze in the way most modern commercial breeds do, consuming vast quantities of grass and nothing else, rather they are adpated to foraging and eating a wide variety of plants. This reduces the intensity of demand on a single species and promotes greater biodiversity, allowing other plants, insects and wildlife to thrive. Paul is deeply committed to the welfare of his animals, spending time with them and farming with his eyes and ears rather than the hard economics of inputs and outputs. For the winter they live in a wonderfully comfortable shed, no slats beneath rather a thick bed of straw that is refreshed twice daily. “I know that when I stop hearing the swishing sound from the straw that it is time for a few more bales”. He manages to finish the animals to a good beef grade without the use of concentrated feeds, using only organic hay that has a rich mix of wild flowers. “They put on weight like this because they are happy.” And it is as clear as day that so is he! Valentines Day is here and with it the sap of romance rises to overflow like molten chocolate in a fountain. The undisputed food of love, chocolate melts your heart as it melts in your mouth. Whether or not it is a true aphrodisiac, it certainly soothes and relaxes. Perhaps more important than all the science about neurotransmitters and amino acids is that chocolate has a cultural place in our food repertoire and our calendar. I must admit I was more than a little curious when my five year old son greeted the news that Valentines Day was coming next week with a cheer, saying “That’s my favourite day of the year!” Where had this romantic streak come from? What plans had he devised and for whom? Should I too be planning ahead a bit more? But then he explained “That’s the day when we have melted chocolate and strawberries” and I realised that a seasonal food tradition had taken root. How lovely it is to have foods to look forward to. Anyway this gave me the perfect excuse to talk about my favourite food and moreover a genuine research mission, so this week I visited Gwen Lasserre at his chocolate shop in Schull. Gwen is one of two chocolatiers weaving his magic in West Cork – the Ó Conaill family in Carrigaline have their own wonder emporium on French Church St in Cork city – an excellently located haven if you need a rich hot chocolate to repair nerve damage from a frazzled shopping expedition. Gwen subsequently pursued another passion – plants, and it was a long time before he got back to chocolate. He came to Ireland to work as a commis chef in Blairs Cove in Durrus and learned on the job, getting up early to finish his vegetable prep work so that he could spend time with the pastry chef. 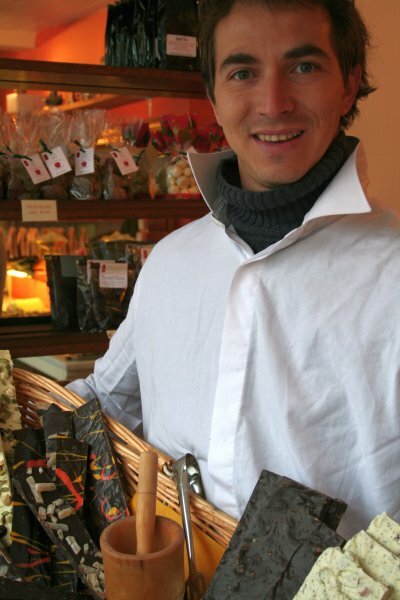 By 2004 he was head chef and he started making petits-fours chocolates to serve with coffee. “I had run my own business twice before and by then I was looking for something to do. I did a bit of research on quality chocolatiers in Ireland and the companies were going well, there was only one other in West Cork so I thought there was an opportunity. I could get all the ingredients and fillings I needed here too, but I didn’t want to make chocolates from a bucket, I wanted to make them from scratch. I needed to learn more, so I went back to France and found a master chocolatier. I worked for free for 3 months with him on condition that I work only on chocolate, not cleaning floors or emptying bins, I’d done enough of that. We worked hard, often late in to the night, but I learned a lot. I still go back to him from time to time.” He showed me the work and care attention that goes into making the praline, marzipan and ganache filling that form the base of his extensive range. His praline is quite unlike that in mass produced chocolate, rich brown in colour and with a roasted nut taste that develops in the mouth rather than hitting up front with sugar and flavouring.